James Kennedy » “Order of Odd-Fish” release party tonight! “Order of Odd-Fish” release party tonight! So. 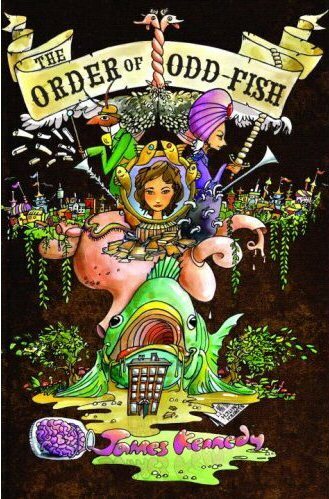 The Order of Odd-Fish is out at last! We’re going to have a release party tonight, 8 o’clock, at the Hideout. My friend Zach Dodson also will read from his new book, boring boring boring boring boring boring boring. And there will be improv by Bella. And music! Brilliant Pebbles and Art School Band will play! Thanks to everyone who helped make this happen. My wife Heather first, of course; she has nurtured this project from its beginning. My parents too, always loving and enthusiastic, and all my family. Anyway — I’ll never forget that morning. Thanks, Lisa and Tina, for plucking me out of your slush pile and making this all come true. Thanks too for fantastic editorial advice, and for finding a wonderful place for it at Delacorte. Thanks to Stephanie Lane, my editor at Delacorte, and her erstwhile assistant Amalia Ellison. Working with Stephanie was an education and a privilege. She shrewdly rooted out inconsistencies and longueurs from the manuscript that I’d never even suspected. She asked perceptive questions that inspired me to rewrite and improve entire sections. Stephanie was easy to trust because she understood what the heart of Odd-Fish was about, behind all its frantic romping. It’s a blessing to have an editor like that. Thanks also to my publicist, Dominique Cimina; the book designer, Angela Carlino; and John Meyers, the genius behind the cover illustration. He captured the spirit of Odd-Fish so well! Writers generally don’t have control of what their book cover looks like, but when I saw Meyers’ first sketch, I knew I didn’t have to worry. His cover is packed with so many loving details and in-jokes from the book, and so wittily done! I can find not only Jo, Sefino, and Aunt Lily, but also an Apology Gun, Dame Isabel’s apparatus for collecting smells, Colonel Korsakov’s digestion, the Odd-Fish lodge, ostriches, Eldritch City, the Eldritch Snitch, the Appendix, an Odd-Fish ring, a biscuit-sword, the fish that vomits out the lodge, even the jar of brains . . . it’s just inspired. I’m proud to have a cover like this. And thanks to Stephanie Morris for putting together this website for me. Pretty classy, eh? All Stephanie’s doing. I appreciate it! I’m looking forward to seeing everyone tonight. It’s going to be fun. You should come!